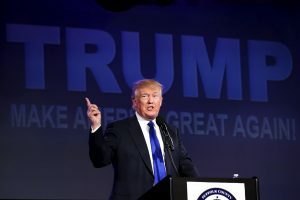 WASHINGTON — Republicans are sprinting to shape up Donald Trump’s presidential campaign before the party’s national convention in three weeks, even as leading members of the party carry a deep antipathy or outright opposition to his claim on the GOP nomination. His campaign chairman said Sunday there’s a hiring spree in 16 states and the campaign is working with the Republican National Committee to solidify other matters. Paul Manafort said Trump is not all that involved in the race to organize an offensive against Democrat Hillary Clinton and catch up to her massive fundraising advantage. What Manafort described as a “new phase” for the campaign – a shift from the primaries to the general election – was a forced reshuffling of an effort hobbled for weeks by infighting, Trump’s statements about a judge’s ethnicity and a massive fund raising deficit to Clinton’s cash-raising Goliath. Trump began June with $1.3 million in the bank, less campaign cash than many congressional candidates. The $3 million he collected in May donations is about one-tenth what Clinton raised. Senate Majority Leader Mitch McConnell said Sunday that Trump can’t win the presidency unless he can compete with Clinton on the financial front. Despite the stated support for Trump, antipathy toward him projected from the Sunday shows and beyond. A few hundred delegates to the Republican National Convention are pushing to change the rules and make it possible for them to vote for someone other than Trump. Many congressional Republicans are skipping the gathering in Cleveland altogether, the latest being Rep. Mia Love, R-Utah, according to the Salt Lake Tribune. Former presidents George H.W. Bush and George W. Bush are not attending. And 2012 GOP nominee Mitt Romney, one of Trump’s most outspoken Trump critics, has opted to spend July 10 through July 21 elsewhere. Trump has said he doesn’t want support from them, but also groused that overall support from Republican leaders has been lacking. On the matter of staffing, there’s evidence the Trump campaign is having trouble attracting some political veterans who are reluctant to sign on to such a late-starting and tumultuous campaign. McConnell refused to say on Sunday whether Trump is qualified to be president. And he suggested that the GOP platform would not reflect Trump’s ideas, including restrictions on Muslim immigration to the U.S.
“It’s my expectation that the platform will be a traditional Republican platform, not all that different from the one we had four years ago,” McConnell replied. With just three weeks to go until the Republican National Convention in Cleveland, the Trump campaign and the RNC are laboring to set up staff in what Manafort said were 16 states in which the campaign aims to compete heavily. He said the campaign will announce more about staffing this week, an effort to reassure people that Trump’s unorthodox campaign is viable. On Sunday, Manafort sought to calm the angst, describing a partnership between Trump’s campaign operation and the Republican National Committee that goes beyond the RNC’s traditional role of raising money for the GOP nominee. He said the transition to the general election is complete – but the details have not necessarily been made public. McConnell and other Republicans said they got the first glimmers of reassurance this week when Trump fired former campaign manager Corey Lewandowski in what Trump described as a change of direction from the GOP primaries to the general election. Lewandowski was at the center of the campaign’s most corrosive internal battles, which Trump allowed to fester for months.